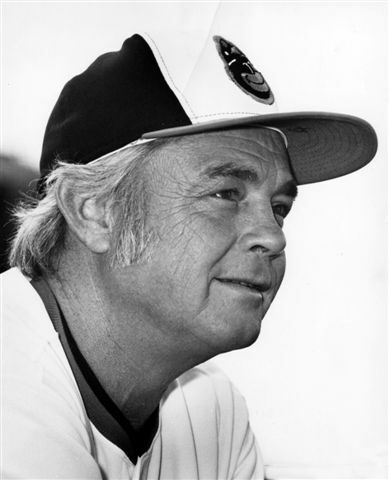 When introducing the Orioles’ new manager in 1968, general manager Harry Dalton said, “In short, I believe Earl Weaver is a winner.”1 Weaver was short. And he was a winner. For the next 14½ seasons the Orioles won more games than any other team, piling up six division titles, four pennants, and one World Series championship. Weaver, a career minor-league player, became the revered Earl of Baltimore while fighting with umpires, his own players, and English grammar. Earl Weaver’s road to the Hall of Fame started on a laundry truck. His father owned a dry-cleaning shop and took care of the St. Louis Browns’ and Cardinals’ uniforms. Young Earl began roaming the clubhouse at Sportsman’s Park when he was 6 years old. Born in St. Louis on August 14, 1930, Weaver showed his shrewdness when he signed his first professional contract at the age of 17. Both hometown teams wanted to sign him, but the Browns offered a $2,000 bonus only if he stuck in the minors; the Cardinals offered $1,500, no strings attached. Weaver became a Cardinal farmhand. As a 5-foot-7-inch second baseman, he made it to the Cardinals’ spring training camp once, but never came close to a big-league at-bat. He had a weak arm and little power, plus a belligerent streak that infuriated umpires and opponents. "The only thing I'd ever wanted in my life was to be a major-league ballplayer, but I had to admit to myself that I wasn't good enough,” he said. “It broke my heart.”2 By his 26th birthday the Cardinals had let him go to Knoxville, an independent Class A club. He reluctantly took over as interim manager of the last-place Smokies at midseason in 1956. That fall Weaver was prepared to leave baseball. He had married Jane Johnston when he was 18 and they had two children (a third came later). He enjoyed his off-season job with Liberty Loan in St. Louis; the company told him he would soon be managing an office. But an assistant in the Orioles’ farm system, Harry Dalton, had met Weaver in Knoxville and was impressed. The Orioles offered him a job as manager of Class D Fitzgerald, Georgia, a one-restaurant town at the bottom level of professional ball. Weaver took the job—and a pay cut. Under manager and general manager Paul Richards, Baltimore was building one of the majors’ strongest farm systems. Farm director Jim McLaughlin’s scouts signed players by the busloads; Richards indoctrinated minor-league managers and instructors to teach the game’s fundamentals the same way throughout the organization. Weaver later named Richards and a longtime manager in the Cardinals system, George Kissell, as his most important teachers. After four seasons managing low-level teams, he was put in charge of the minor-league spring camp in Thomasville, Georgia, in 1961. But the young manager’s temper threatened to torpedo his career. His rages at umpires prompted at least two league presidents to call Harry Dalton and demand that he muzzle his wild man. Dalton warned Weaver that his frequent ejections were interfering with his job teaching players. Still, he was a winner, with three pennants and five second-place finishes in 11 years. Starting in 1962 he spent four seasons at Elmira, New York, in the Double-A Eastern League. His first wife left him—her parting words were, “Earl, the only thing worse than you being gone is you being home.”3 In 1964 he married Marianna Osgood, a divorcee with a young daughter. He bought a house in Elmira and was content to make his home there. The Orioles promoted Weaver to their top farm club in Rochester in 1966. After he led the club to a pennant and a second-place finish, Dalton, now the Orioles’ general manager, brought him to Baltimore as a coach in 1968. When Bauer was fired at the All-Star break, the Orioles stood slightly above .500 but far out of the pennant race. Weaver’s promotion was no surprise, but he couldn’t even take his dream job without a fight. He rejected Dalton’s first salary offer and stood firm until the GM agreed to pay him $28,000. As soon as Weaver took over, the team’s unquestioned leader, Frank Robinson, asked what he could do to help. Weaver urged him to autograph baseballs, a chore the players detested. When Robinson began signing, the rest of the club did, too. Robinson’s attitude helped Weaver—the bush leaguer—win acceptance in the clubhouse. In addition, he had managed nearly half the Orioles on their way up through the minors. He put a sign on the clubhouse wall: “It’s what you learn after you know it all that counts.” Baltimore made a run at the league-leading Tigers, but could not catch them. The Orioles, 43-37 when Bauer was fired, went 48-34 under Weaver and finished second. In 1969, the first year of division play, Baltimore ran away with the American League East title. Frank Robinson returned to superstar form, 23-year-old right-hander Jim Palmer pitched like a budding superstar after two years of arm trouble, and Mike Cuellar, a 32-year-old left-hander acquired from Houston, won 23 games. Young lefty Dave McNally won his first 17 decisions and finished 20-7. The Orioles moved into first place in the season’s ninth game and stayed there. Their lead stretched to 22 games in mid-September. After a 109-53 regular season, Baltimore swept the Twins in the first American League Championship Series and won the opening game of the World Series against the “Amazin’” Mets. The 1970 Orioles’ record looks equally impressive at 108-54, as the team spent all but nine days in first place and again allowed the fewest runs in the league, but the race was closer in the first half before Baltimore pulled away. Palmer joined Cuellar and McNally as 20-game winners and Boog Powell won the MVP award. The club came from behind to win 42 times and finished the season with 11 straight victories, then swept the Twins in the playoffs. Before the 1971 season opened, Sports Illustrated anointed the Orioles “The Best Damn Team in Baseball.”9 This time they had four 20-game winners, racked up 101 victories, and swept the Oakland A’s in the playoffs to claim their third straight pennant. The World Series against the Pirates went the full seven games before Pittsburgh won the championship. It was Roberto Clemente’s Series; he batted .414 with 12 hits and two homers. Baltimore had put up a historic run, despite losing two out of three World Series. Only the 1929-1931 Philadelphia A’s and the Yankees (several times) had won three consecutive AL pennants. But the core of the team was aging. Frank Robinson, 35, was traded after the 1971 season to make room for young outfielder Don Baylor. Mike Cuellar was also 35, Brooks Robinson and Don Buford, 34. The franchise’s strong farm system provided some replacements, but none who could match the two Robinsons. The Orioles fell to third place in 1972, then rallied to win division titles in ’73 (Weaver was named American League Manager of the Year) and ’74 before losing in the league playoffs both times. A greater threat emerged when major-league players won free agency in 1976. Even during their best years the Orioles had been laggards at the gate; the club was embarrassed by empty seats at some playoff games. Owner Jerry Hoffberger didn’t have the deep pockets to compete with the free-spending Yankees and Angels. Home-grown stars Wayne Garland and Bobby Grich moved on, along with several lesser players. Don Baylor, a year away from free agency, was traded to Oakland for, among others, Reggie Jackson, who signed with the Yankees after one season in Baltimore. General manager Hank Peters said he had watched an all-star team walk out the door. During the long dry spell between pennants, from 1972 until 1979, Weaver’s reputation grew as he juggled the turnover on his roster and usually kept the Orioles in contention. He won another Manager of the Year award after a second-place finish with a young team in 1977. Always quotable, he was catnip for sportswriters and was never shy about saying what he thought. He was famous for his devotion to statistics tracking head-to-head matchups between pitchers and hitters, something other managers either claimed to keep in their heads or ignored altogether. His celebrated note cards (actually a combination of cards and loose-leaf notebooks) told him Boog Powell couldn’t hit Detroit left-hander Mickey Lolich, so Powell didn’t play against Lolich. His good-field, no-hit shortstop, Mark Belanger, turned into a .300 hitter against Nolan Ryan, so Belanger moved up in the lineup when Ryan pitched. He platooned Gary Roenicke and John Lowenstein; combined, they outhit most teams’ regular left fielders. Pitchers were his particular targets. Dave McNally spoke for most of them when he said, “The only thing Earl knows about pitching is that he couldn’t hit it.”16 Weaver’s battles with Jim Palmer—elegant ace and world-class worrier—sometimes played out on the mound in view of the fans. When a fading Mike Cuellar complained that Weaver wouldn’t give him a chance, Weaver scoffed, “I gave Mike Cuellar more chances than I gave my first wife.”17 He believed rookie pitchers should begin their careers in long relief, where they faced the least pressure. That early coddling may help explain why Orioles pitchers seemed immune to arm injuries. And he stuck with a four-man starting rotation long after almost every other manager had switched to five, reasoning that it was easier to find four reliable starters than five. He kept his distance from his players, because “you’re the person who decides all the worst things in their lives.” The manager benches them, sends them to the minors, and one day has to tell them they’re through. “You can’t help loving them, yet you can’t afford to.”18 He believed his off-season jobs as a loan officer and used-car salesman had taught him to read people. He also believed in hypnotism and recommended it to cure everything from batting slumps to emotional problems. His feud with flamboyant umpire Ron Luciano began in Elmira and continued for two decades. He didn’t exactly get in Luciano’s face; the hulking former football lineman jeered, “I have to tell him to get his nose off my kneecap.” Once Luciano publicly proclaimed, “I don’t care who wins the pennant as long as it isn’t Baltimore.” The league office kept him away from the Orioles for a while, but when Luciano and Weaver confronted each other again, Weaver protested the game “on the grounds of the umpire’s integrity.”20 That earned the manager a three-game suspension. In 1978 the Orioles fell to fourth in the seven-team Eastern Division as a new generation of key players matured: first baseman Eddie Murray, third baseman Doug DeCinces, and pitchers Mike Flanagan, Dennis Martinez, and Scott McGregor. But Weaver, like many veteran managers, had become impatient with youngsters. He was so hard on them that anyone who got a kind word was called “Earl’s son” by his teammates. Weaver thought his 1979 club was nowhere near as talented as the ’69-’71 juggernaut–“But they won,” he said.21 Jim Palmer gave Weaver his 1,000th career victory on Opening Day. Baltimore charged into first place on May 18 and stayed there despite injuries to Palmer, DeCinces, and several others. As Weaver rotated his role players in and out of the lineup, some observers called them the “Who’s That?” team. Weaver won his third Manager of the Year award from the Associated Press. Baltimore rang up 102 victories before beating the Angels in the playoffs. The Orioles set a franchise attendance record, quieting some of the fears that the new owner, Washington lawyer Edward Bennett Williams, planned to move the team to the nation’s capital. In the World Series against the Pirates, Baltimore took a three-games-to-one lead, then it turned into ’69 all over again. The Orioles’ bats went silent; they scored only two runs in the last three games. In the decisive Game Seven Weaver used 20 players, including six pitchers and five pinch-hitters, but Pittsburgh claimed the championship. The next year the Orioles won 100 games for the fifth time in Weaver’s tenure (they won at least 90 in seven other seasons), but finished three games behind the Yankees. In ’81 they were in second place when the players went on strike, then slumped to a losing record in the second half. Weaver was arrested for drunk driving on August 31, the second time he had been caught driving while impaired, but that did not seem to hurt his popularity in Baltimore. Weaver thought his influence in the organization was waning when Peters traded third baseman DeCinces to open the position for rookie Cal Ripken Jr. Weaver, alone among the decision-makers, wanted the 6-foot-4 Ripken to play shortstop. Although he was only 51, Weaver announced that 1982 would be his last year. Retirement was his own idea, but GM Hank Peters later said he thought Weaver was slipping. It looked as if Weaver’s final season would be his worst when the Orioles fell to last place in May. But they rallied with a 15-9 June and began chasing the Milwaukee Brewers, a team built by Weaver’s patron, Harry Dalton, and called Harvey’s Wallbangers after manager Harvey Kuenn, who took over in June and turned the Brewers’ season around. Weaver was juggling an aging lineup with only two rising stars. Eddie Murray put up his first 30-homer, 100-RBI year. The 21-year-old Ripken started the season at third base, but Weaver moved him to shortstop on July 1. Ripken hit 28 homers and won the Rookie of the Year award. No pitcher had an ERA under 3.00 or won more than 16 games. The club’s marketing department was touting “Oriole Magic.” Baltimore was seven games behind on August 28 when the magic materialized. They won ten in a row. But Milwaukee still led by three with four games left—four games in Baltimore. The Orioles had to sweep to win the division. The showdown started with a Friday doubleheader before a frenzied sellout crowd. The Orioles knocked out Milwaukee’s ace, Pete Vuckovich, as they piled up 15 hits and won, 8-3. In the nightcap Baltimore’s 20-year-old rookie right-hander Storm Davis pitched his first complete game, backed by Murray’s and Ripken’s homers, for a 7-1 victory. The next day the Orioles pummeled Brewer pitching for 18 hits and an 11-3 win to tie for first place. That set up a winner-take-all 162nd game matching Jim Palmer against Don Sutton. Both future Hall of Famers labored. Sutton, shot full of cortisone and penicillin for a sore throat, gave up ten hits and five walks, but kept wriggling out of trouble; the Orioles left a dozen runners on base. Robin Yount, who would win the MVP award, touched Palmer for two home runs. Palmer left after Cecil Cooper added another homer in the sixth to give Milwaukee a 4-1 lead. The Brewers tacked on another run, then iced their cake with five in the ninth to deny Weaver his seventh division title. Weaver’s last season was over, but the crowd of 51,642 wouldn’t go home. They shouted, “Earl, Earl!” When the little manager finally came back onto the field, he contorted his body to spell “O-R-I-O-L-E-S.” The love-fest lasted 45 minutes, a tribute to the man who had reigned as the pugnacious face of the franchise from the heyday of Brooks Robinson to the coming of Cal Ripken, Jr.
Weaver and Marianna moved permanently to their winter home in Miami, where they indulged their love of golf and the horse and dog races. Other teams offered jobs—11 times, by Weaver’s count—but he insisted he was done with managing. It took one of the country’s greatest lawyers to argue him out of retirement. The Orioles won the 1983 pennant and World Series under Weaver’s successor, Joe Altobelli, then fell to fifth place in the East the next year (although with a winning record). Owner Williams grew contemptuous of his manager—by one account, referring to Altobelli as Cement Head. When the club fell into a slump early in 1985, Williams began pining for Weaver. Weaver needed a job. He had given up his part-time consultant’s role with the team and had been dropped from ABC-TV’s broadcast booth. He said inflation was eating up his retirement nest egg. When Williams dangled a reported $500,000 salary, Weaver jumped at it. At his first game back on June 14, a big crowd chanted, “Weaver! Weaver!” But he could barely recognize the club he inherited. While Murray and Ripken were still the anchors, the vaunted farm system appeared to have dried up. Williams had imported several aging free agents who didn’t know or care about “The Oriole Way.” The team did worse under Weaver (53-52) than it had under Altobelli (29-26). Weaver said he returned to the dugout in 1986 because the thought the team could win. On August 5 they were just 2½ games out of first place, despite injuries to Murray, center fielder Fred Lynn, and a dozen others. Then the Orioles collapsed. They went 14-42 the rest of the way to finish last for the first time in their history. Murray asked to be traded after owner Williams insinuated he was out of shape. The clubhouse turned surly. The pitching was awful (tenth in the league in runs allowed) and the defense was worse. By Aug. 21 Weaver told Williams he would not be back. When Weaver’s first losing season mercifully ended, there were no curtain calls. Weaver returned home to Miami and made his retirement stick this time. Weaver was elected to the Baseball Hall of Fame in 1996. Forty years after the Orioles’ 1970 World Series victory, surviving members of the team were honored at the Orioles’ new ballpark in 2010. When the 79-year-old Weaver took the lineup card to home plate before the game, umpire Bob Davidson ejected him. Earl Weaver, 82, died about 2 a.m. on January 19, 2013 of an apparent heart attack while on an Orioles' fantasy cruise aboard the Celebrity Silhouette in the Caribbean Sea. No one’s going to give a damn in July if you lost a game in March. If you don’t make any promises to your players, you won’t have to break them. Your most precious possessions on offense are your 27 outs. If you play for one run, that’s all you’ll get. Don’t play for one run unless you know that run will win a ballgame. It’s easier to find four good starters than five. The best place for a rookie pitcher is long relief. The key step for an infielder is the first one—left or right—but before the ball is hit. The job of arguing with the umpires belongs to the manager, because it won’t hurt the team if he gets kicked out of the game. 1 Baltimore Sun, July 12, 1968, C1. 2 “Baltimore’s Soft-Shelled Crab,” Time, July 23, 1979, online archive. 3 Earl Weaver and Berry Stainback, It’s What You Learn After You Know It All That Counts (Doubleday, 1982), 133. 4 John Eisenberg, From 33rd Street to Camden Yards (Contemporary Books, 1981), 185. 5 Terry Pluto, The Earl of Baltimore (New Century Publishers, 1982), 70. 6 Baltimore Sun, June 25, 2010, online edition. 7 Baltimore Sun, October 16, 1970, C1. 8 Earl Weaver, John Sammis, ed., Winning! (William Morrow & Co., 1972), 153. 9 Frank Deford, “The Best Damn Team in Baseball,” Sports Illustrated, April 12, 1971, online archive. 10 Baltimore Sun, September 23, 1979, 25. 11 Earl Weaver with Terry Pluto, Weaver on Strategy (Brasseys, Inc., 2002), 39. 12 Pluto, The Earl of Baltimore, 81. 13 Pluto, The Earl of Baltimore, 173. 14 Pluto, The Earl of Baltimore, 168. 16 Weaver and Stainback, It’s What You Learn, 223. 17 Baltimore Sun, October 3, 1979, B3. 18 Weaver and Stainback, It’s What You Learn, 10. 19 Weaver and Stainback, It’s What You Learn, 51. 20 Weaver and Stainback, It’s What You Learn, 54, 76. 21 Eisenberg, From 33rd Street to Camden Yards, 332. 22 Weaver with Pluto, Weaver on Strategy.